Unsurprisingly, Joules’ have earned themselves a loyal following of fans due to their gorgeous designs and the women’s jackets, coats and gilets on offer from Joules for this season are no exception. For SS14, the Joules capsule collection encompasses bright contrasting colour palates and exciting printed linings, adding a flash of colour and dimension to your outfit when worn open. There is also a carefully selected range of Joules women’s tailored jackets on offer, great to dress up your favourite jeans for a lunch date or to be worn over dresses and skirts for more formal occasions. Accompanying this inarguable style is the high quality that Joules are renowned for. As soon as you slip on a piece of Joules outerwear nothing else will compare! A classic quilted jacket for a classic country look – it doesn't get much better than the traditional Joules Newdale Quilted Jacket. The branded Joules buttons lead up to an on-trend high neck that adds a dash of style and will also help to keep cold winds at bay on cooler days. The Newdale jacket boasts four pockets to the hips, two hand warmer, and two with zips which make great spaces to store all of your everyday bits and pieces. The lining is a beautifully designed print that is unique to Joules, adding a special touch of feminine design to the mix. The Joules Newdale jacket has a rounded hem to the front to add a touch of feminine country charm, while the Joules hare sits proudly on the hem as a symbol of style and quality. Take on those rainy days in style with the Women's Joules Coast Waterproof Jacket. Crafted from beautifully soft cotton, this jacket is sure to keep you comfortable all day long, and boasts a waterproof outer to keep the elements at bay. Whether you are walking through the country or heading into town, the Coast Jacket will keep you dry, with a front zip and button front that fasten up to a stand collar and hood for added protection against those chilly winds and showers. 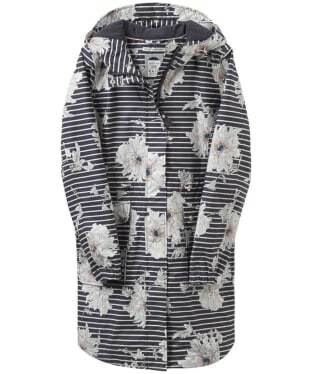 In true Joules style, this on-trend jacket is finished with a bespoke printed lining for a pretty feel. 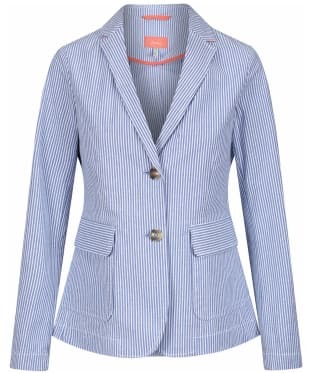 Smart enough to dress up, yet relaxed enough for a casual look, the Women's Joules Erica Blazer is a wardrobe essential for any stylish lady. Crafted from super soft cotton with an added touch of elastane for ease of movement, this jacket will be comfortable to wear whether you are heading into the office or town. Designed with a timeless two button front fastening and two front pockets, this blazer really is a timeless piece that we know you will love. The Erica is finished with signature Joules branding for a premium, on-trend feel. 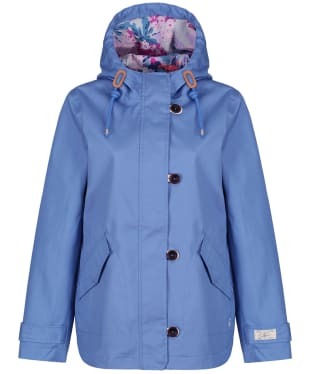 Inspired by the original Joules Coast style, the Women's Joules Coast Mid Length Waterproof Jacket offers a longer design, to offer even more protection from the elements. Boasting a fully waterproof outer, this soft and comfortable coat is sure to be your perfect partner whether you are walking through the country or simply taking the children to school. The zip and button down front fasten up to an adjustable hood to keep your head and ears cosy during the chilly, wet weather. The practical features don't stop there, you will find two pockets to the front where you can store your personal essentials with ease. Sure to keep you on-trend through this season and beyond, the Coast jacket is finished with signature Joules branding for that added mark of quality and style. Take on those rainy days in style with the Women's Joules Dockland Reversible Waterproof Jacket. With a stunning unique to Joules print on one side, and a plain colour to the other, what more could any stylish lady possibly want? We love that this easy to wear jacket will go with all of your wardrobe choices to complete your stylish attire with ease. Whether you are walking the children to school or simply heading into town for a spot of shopping, this fully waterproof jacket has been designed with a hood as well as a full front zip that fastens up to a stand collar to keep you protected from the unpredictable weather. This stylish yet highly practical jacket is finished with signature Joules branding for that added mark of quality and style. Perfect for taking with you wherever you go, the Women's Joules GoLightly Waterproof Jacket packs away into the pocket, so that it can be easily stored in your handbag, ready for when the unpredictable weather strikes! Practical and stylish, this jacket is fully waterproof and has taped seams to keep the rain at bay, with a hood for added protection. The parka style GoLightly boasts a beautiful bespoke Joules print to keep you looking on-trend through this season and beyond. Perfect for taking with you to your favourite festival or family day out, the Women's Joules Showerproof Poncho is sure to keep you dry. 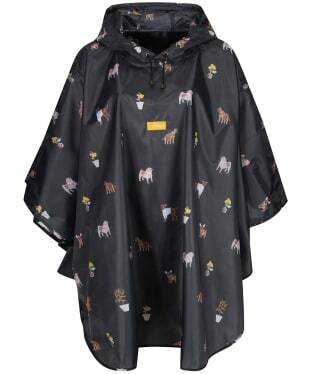 Handy and convenient, this poncho can be packed away into its own bag and boasts a bespoke Joules print for that on-trend feel. 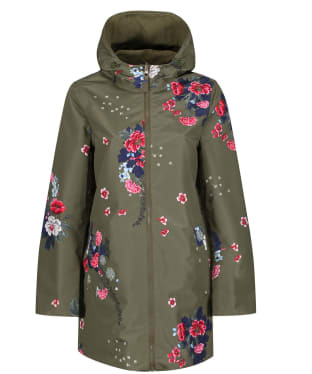 Take on those rainy days in style with the Women's Joules GoLightly Short Waterproof Jacket. A new take on a Joules classic, this shorter length design is perfect for whether you are heading into the town or country. Designed with a fully waterproof outer and a full front zip that fastens up to a grown hood, you can be sure that those rain showers will be kept at bay. Pretty and practical, this jacket has an all over unique to Joules print to offer and on-trend feel, and packs away its own pocket making it super easy to store on those sunnier days! 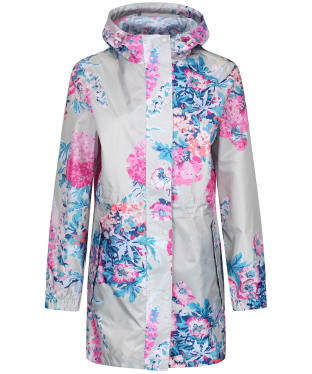 Brighten up those rainy days with the Women's Joules Raine Printed Waterproof Jacket. Designed with style and practicality in mind, this beautiful jacket boasts a fully waterproof outer to keep the unpredictable weather at bay whether you are out in the town or country! 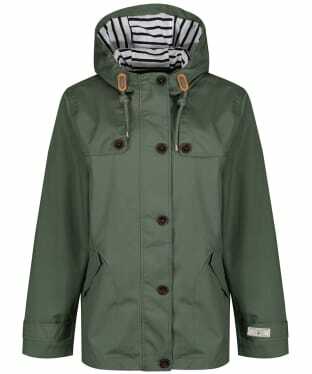 The full zip and button placket fasten up to a funnel neck and a hood, to provide extra protection against the elements. For that added touch of practicality, there is also a fishtail hem to the back. Sure to offer a fashion forward feel, the Raine Printed Jacket has an adjustable waist so that you can create a more figure hugging, flattering look, or a relaxed fit so that you can fit those chunky jumpers underneath during the cooler weather! In true Joules style, the jacket has a stunning all over hand drawn print, to keep you on-trend through this season and beyond. 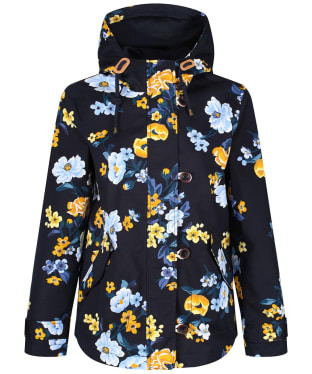 Bursting with colour, style and still highly practical, the Women's Joules Coast Printed Waterproof Jacket is sure to be your go to piece whether you are heading into town or simply walking the children to school. Crafted from super soft cotton for a comfortable feel, this waterproof coat is one of our favourites season after season. It boasts a beautiful bespoke printed outer to keep you on-trend, as well as offering a zip and button front that fasten up to a hood to keep the unpredictable weather at bay, what is there not to like? The Coast Printed Jacket is perfect for pairing with your favourite Joules top, jeans and boots to complete your outdoor attire with ease. A classic style that is popular season to season, the Joules Coast Waterproof Jacket is one of Joules best-loved waterproof jackets, with so many design features you won't want to take it off! Crafted from 100% waterproof cotton and featuring a gown hood for protection from the elements and two front buttoned pockets to keep your personal belongings safe. Other features include a jersey lining, storm cuff details, a curved hem for a feminine feel and storm flap detail to the shoulders. Cut to a flattering fit and suiting most shapes and sizes the Joules Coast Waterproof Jacket is a must have for any stylish ladies wardrobe. Perfect for layering over your favourite Joules tee or sweater, the Women's Joules Fallow Quilted Gilet is an essential piece for adding warmth without the weight of a winter coat. 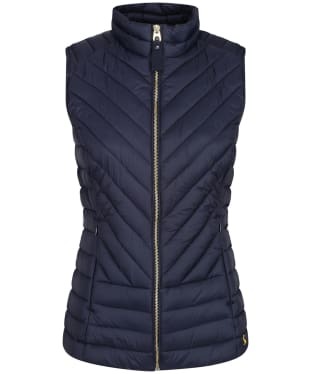 Designed with style and practicality in mind, this gilet has a baffle quilted outer, with contrast side panels for a flattering, feminine silhouette, and boasts a full zip that fastens up to a stand collar to keep those chilly winds at bay. The Fallow is finished with signature Joules branding for that on-trend, quality feel. A beautiful addition to this seasons Joules collection, the Women's Tweed Fieldcoat is perfect for those days spent out in the country. Crafted from a stunning wool mix tweed, this Fieldcoat captures true country style, with a suede stand collar to keep those chilly winds at bay, and brass trims complimenting the tweed colours to create an on-trend look that you are sure to love. 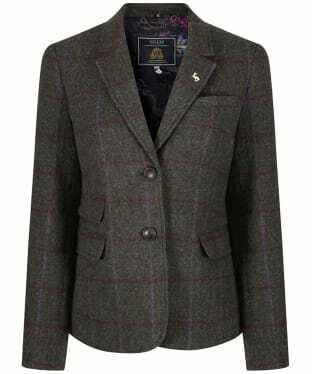 This tweed jacket is sure to compliment your other Joules wardrobe pieces, adding warmth and comfort when the weather starts to get cooler, with the curved hem and stunning bespoke Joules printed lining giving you that fashion forward feel. For your added convenience, there are two stud fasten pockets to the front of the jacket, providing ample space to store your personal item whilst you are out and about, as well as a full zip and popper front fastening to keep you cosy. Bursting with country charm, this jacket is the ideal choice, whether you are competing in sports or simply taking a walk out, and is finished with signature Joules branding for that mark of quality excellence. 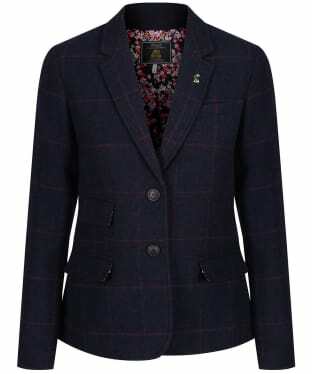 Whether you are heading out for a country stroll or you're off to spend the day at the races, the timeless Women's Joules Wiscombe Tweed Blazer is sure to be your perfect partner. Beautifully designed in 100% unique to Joules wool tweed, we love the country inspired feel of this jacket that is the ideal piece to place over your favourite sweater or shirt to complete your smart casual look with ease. Even during the cooler months, the wool outer will keep you cosy, whilst offering a sophisticated finish to your look. For a classic feel, the blazer has a single breasted style, with double flap pockets to the front as well as a single ticket pocket for that elegant finish and space to store your personal essentials whilst you are out and about. Bursting with some of our favourite Joules features such as the stunning bespoke printed lining and hare logo to the chest, we think that this blazer is an essential addition to any stylish lady's wardrobe. 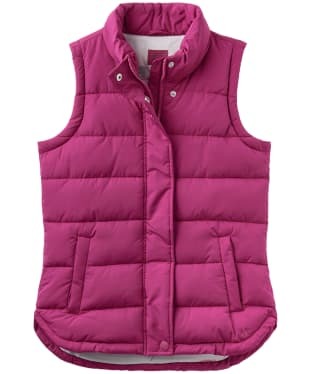 Perfect for placing over your favourite Joules sweater, tee or shirt, the versatile Women's Joules Eastleigh Padded Gilet is sure to keep you cosy on those cooler days, adding warmth without the weight of a jacket. 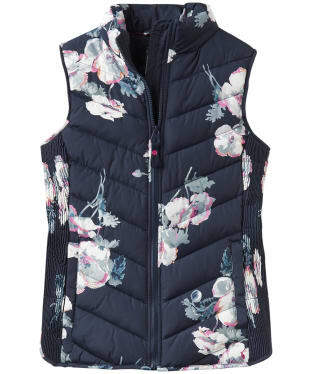 Boasting a beautiful baffle quilt design, this gilet will keep you on-trend through this season and beyond, and features a pretty Joules bespoke lining for that added touch of style. For a practical feel, the Eastleigh has two outer pockets, providing the ideal place to store your essential items whilst you are out and about, with a classic zip and button placket front fasten to keep those chilly winds at bay. 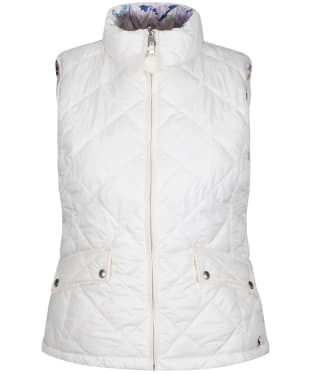 The gilet is finished with signature Joules branding for that quality, fashion forward feel. Brighten up any rainy day with the Women's Joules Golightly Waterproof Packaway Jacket, featuring a stunning bespoke hand-drawn Joules print, to keep you looking on-trend through this season and beyond! The 100% waterproof jacket is perfect for when those showery days arrive, with an adjustable grown hood, elasticated cuffs and zip and popper front fastening providing extra protection from the unpredictable weather. This stunning jacket has definitely been designed with practicality in mind, there are two front popper pockets, ideal for storing your essentials when you're out and about, and you can easily pack the Golightly Jacket away for when the weather gets warmer! This versatile jacket is a wardrobe essential for any stylish lady, with the elasticated waist sure to give you a figure flattering feminine silhouette, adding a fashion forward feel to your look, whether you are walking the kids to school, or exploring the country. An updated version of a Joules favourite, the Women's Gosling Short Padded Jacket is an essential piece for any stylish lady's wardrobe. 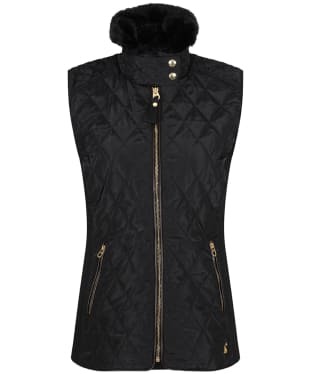 Perfect for keeping you warm and cosy when the weather gets cooler, the jacket features a beautiful baffle quilted design, with a faux fur trimmed hood to keep those chilly winds at bay and to offer that added touch of seasonal glamour! With contrast side panels and a curved hem to give you a figure flattering, fashion forward look, this easy to wear jacket also boasts two zip fasten front pockets, providing ample space to store your personal essentials whilst you are out and about. Whether you are walking the children to school or heading into the country for a stroll, this padded jacket has a full zip front fasten to offer extra protection from the cold. Finished with signature Joules branding for that added mark of quality, pair the Gosling with your favourite Joules jeans and sweater to complete your on-trend look. 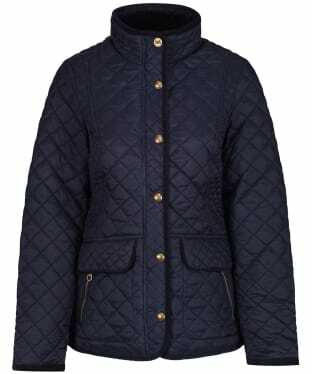 Complete that classic country look in style this season with this pretty and practical Joules Newdale Quilted Coat. 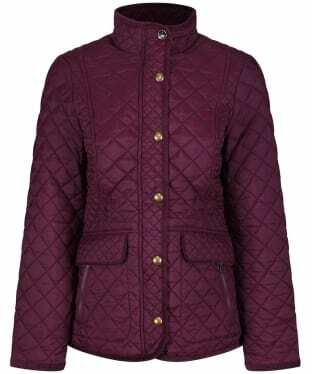 With a traditional diamond quilted finish, this Joules coat is ideal for the colder months, and offers a regular fit to allow for ease of movement and layering. 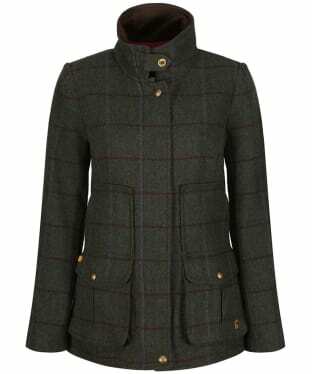 The Newdale is an ever popular style that continues to be a firm favourite of country ladies season after season, and it's easy to see why; classic Joules finishing touches including a bespoke floral lining and signature Joules hare branding sit alongside practical features such as a funnel neck and multiple pockets. 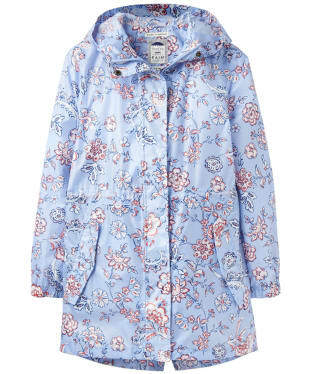 This beautiful waterproof Joules Coast Print Coat features an all over, hand drawn floral print that is unique to Joules, with subtle pops of colour on the trims. 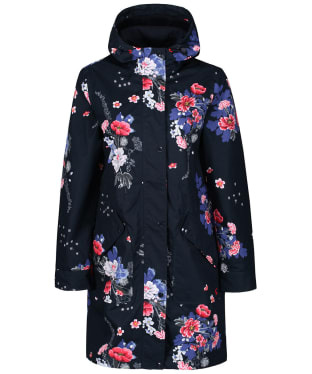 Featuring an adjustable grown hood for complete protection from the rain, this Joules waterproof coat is finished with a button and zip closure and two buttoned pockets to ensure you can keep all of your everyday essentials close at hand. 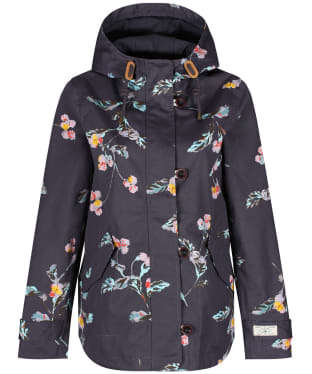 Take on those rainy days in style with the Women's Joules Coast Print Waterproof Jacket. 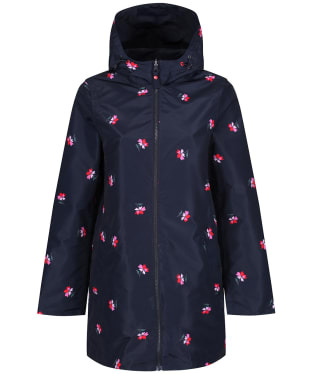 Part of the Joules Right as Rain collection, this on-trend jacket has been crafted from fully waterproof 100% cotton for a comfortable, breathable feel that is sure to keep you dry when those showers arrive! 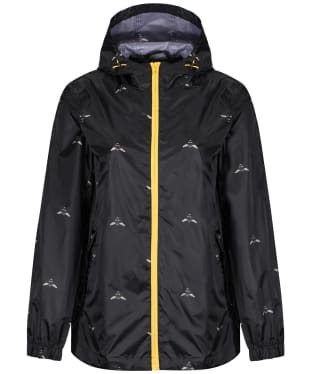 Featuring a grown hood and storm flaps to offer the upmost protection from the unpredictable weather, the Coast Print jacket also boasts two front pockets, providing ample space to store your essential items whilst you are out and about. This classic Joules style has a curved hem so you will find that it is super easy to wear, with cord toggles for that added touch of stylish detailing, making it the ideal choice for wearing all day long, whether you are simply taking the children to school or heading out on a country walk! 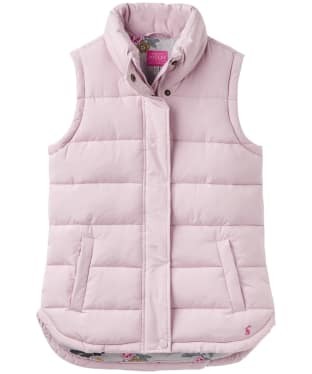 The perfect layer to keep you warm without the weight of a winter coat, the Women's Joules Inverness Quilted Gilet boasts a full zip that fastens up o a funnel neck, as well as a detachable faux fur trim sure to keep those chilly winds at bay whilst adding a touch of winter glamour! 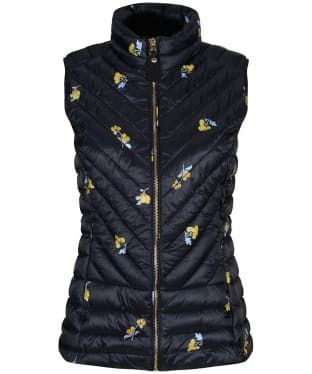 Whether you are walking the children to school or heading into town, this gilet will keep you looking stylish, designed with a diamond quilted outer for that country inspired feel, and a pretty bespoke print to the lining. For a practical feel, there are two zip fasten pockets to the front, providing space to keep your personal essentials safe whilst you are out and about. Finished with signature Joules branding for that quality feel, place the gilet over your favourite Joules top or sweater to complete your on-trend look with ease. 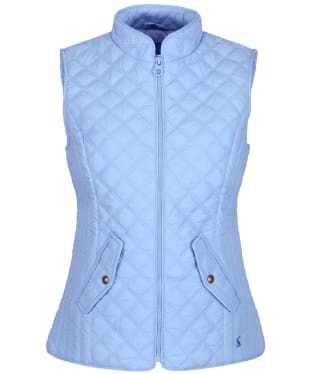 The Women's Joules Brindley Gilet has been designed with beautiful chevron quilting, along with baffle quilting to the side panels to give you a figure flattering look that you are sure to love! 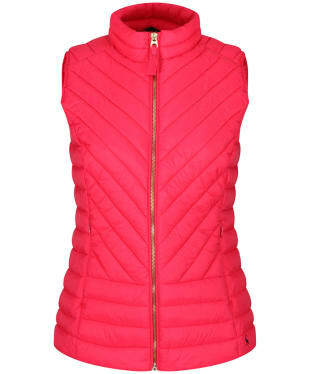 Cut to a slim fit, this on-trend gilet will add a pop of colour to any outfit, making it perfect for placing over your favourite Joules sweater or top. The full zip will fasten all of the way up to the stand collar, to keep those chilly winds at bay whilst you are out on those country walks, with the two front side pockets sure to keep your personal essentials stored securely when you are out and about. 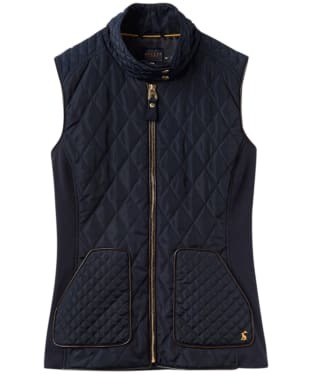 For that fashion forward, quality feel, the Brindley Gilet is finished with signature Joules hare logo branding. 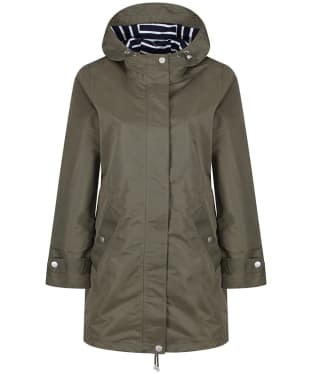 The Women's Joules Aspen Mid Length Waterproof Parka Jacket is perfect for keeping you warm and cosy once those cooler days arrive. 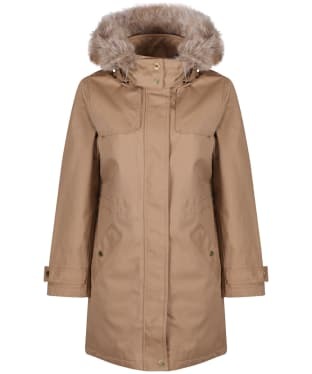 Sure to be comfortable to wear, this super soft 100% cotton parka style jacket has a grown hood that is trimmed with faux fur for that added touch of seasonal glamour, as well as two storm flaps to the top of the parka, to keep you protected from those chilly winds. Perfect for whether you are heading into town or simply walking the children to school, you can be sure that this jacket will keep you looking on-trend, with an elasticated waist to offer you a figure flattering look. For your added convenience, there are two front popper fasten style pockets, ideal for storing your personal items whilst you are out and about, that are lined with faux fur to keep your hands snug, as there are always times when we forget our gloves! 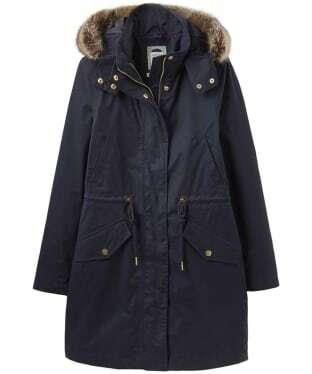 This classic style has a front zip and studded placket fasten for a practical feel and that added touch of wearability, with signature Joules branding finishing off the Aspen Mid Length Parka with stylish ease. The perfect addition to compliment any outfit, the Women's Joules Cassidy Safari Jacket is an essential piece for any stylish lady's wardrobe. Crafted from an easy to wear, breathable fabric, the Cassidy will look fabulous when paired over your favourite Joules tee or vest, for a fashion forward look that will keep you on-trend through this season and beyond! Designed with an elasticated waistband the versatile Cassidy jacket will give you that perfect fit, and also features a chest pocket and two lower button fasten pockets for added practicality. The jacket is finished with Joules signature hare logo for that classic mark of quality. The Joules Wyndfall Jacket is a versatile winter coat that is designed specifically to guide you through the colder months. 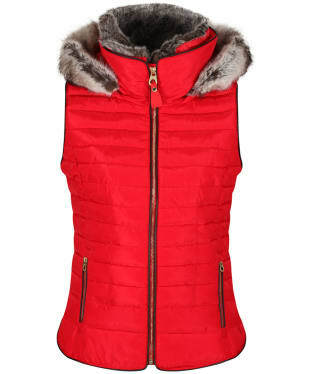 With an inner feather and down jacket that can be easily removed to adapt to the weather or worn alone, the Wyndfall jacket also offers a detachable faux fur trim to the hood to add a touch of glamour to the outfit. The adjustable waist allows for a neat fit, showcasing a feminine silhouette and ensuring cold winds are kept at bay, while the longer design and curved hem adds to the overall wearability of the piece. This ultra warm Joules winter coat is ideal for everyday wear, whether you're on the commute or out for a family day, the multiple pockets along with the 3-in-1 design means it's sure to become a firm wardrobe favourite. 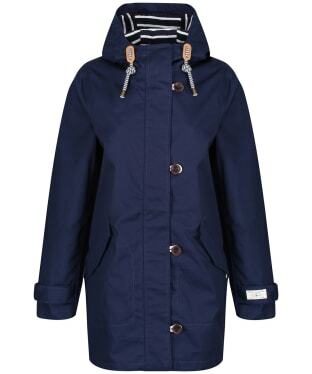 Stay dry and stylish this season with the Joules Raina Waterproof Parka! With taped seams an adjustable grown hood that comes complete with a peak to allow water to drip away, the Raina jacket is perfect to tackle this unpredictable British weather. When the sun comes out from behind the clouds, the Raina will ensure you're still kept cool and comfortable as it's not only waterproof but breathable too! This season's Raina jacket is lined with a soft cotton jersey to offer added warmth and comfort on cool days, and can be adjusted at the waist to offer a sleek feminine silhouette and keep cold winds at bay. 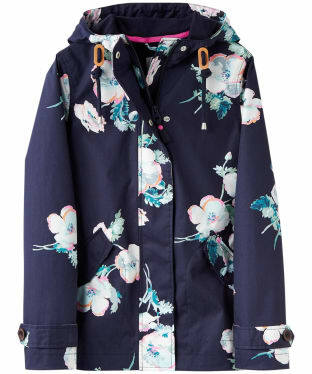 The Raina Waterproof Parka is finished with a soft curved hem and a beautiful bespoke Joules print. 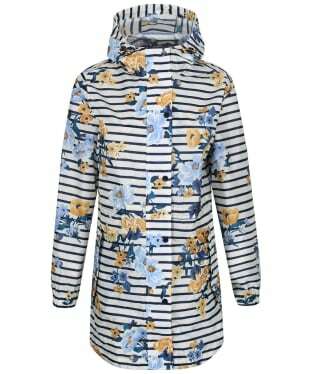 The women's Joules Coast Print Waterproof Jacket is a classic style offering practicality, without compromising on style. 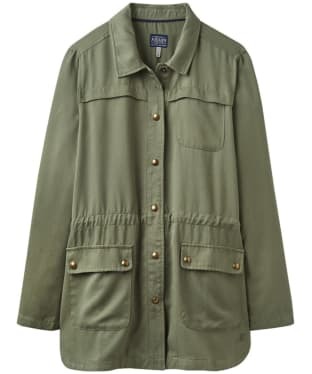 Crafted from 100% waterproof cotton the jacket features include a jersey lining with a subtle pop of colour on the trims, storm cuff detail, a curved hem for a feminine feel and storm flap detail to the shoulders. The grown hood features adjustable draw cords, great for blustery days and protecting you against the elements and the button and zip closure keep you cosy when needed and you can also match the print to your favourite Joules wellies!. 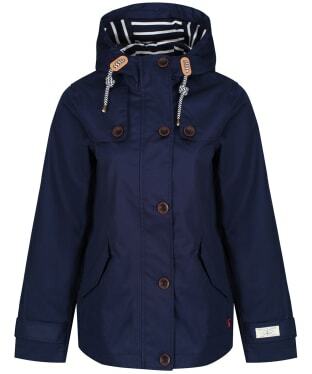 The Joules Coast Print Waterproof Jacket is finished with two front buttoned pockets and the Joules Hare logo. With so many design features it is sure to become a wardrobe favourite. 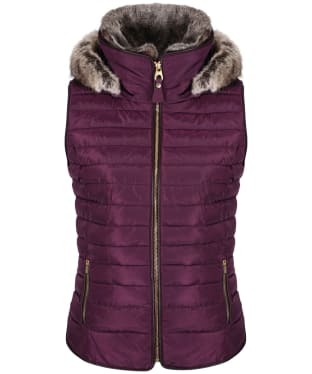 Perfect for adding warmth to your outfit without the weight of a winter coat, the Women's Joules Melbury Hooded Gilet has been designed with a beautiful baffle quilt for that on-trend feel, with a detachable hood trimmed with faux fur for that added touch of winter glamour! Sure to keep the chilly weather at bay, the gilet features a full zip front fasten, as well as a funnel neck, making it ideal for those cooler months. Whether you are heading into the town or country, the Melbury has side panel detailing to give you that stylish feminine feel, as well as two front zip fasten pockets providing you the ideal place to store your essential items whilst you are out and about. Finished with signature Joules branding for that quality, fashion forward feel, pair the gilet with your favourite Joules tee, sweater or shirt to complete your stylish look. The classic fitting Joules Eastleigh Padded Gilet makes a welcomed return this season. The perfect layer if you're on the go, featuring baffle quilting and panel stitching, a concealed zip, popper closure and a stand collar for cooler days. The two side entry pockets are great for storing your small personal belongings and the hand-drawn print lining adds a subtle pop of colour. The Joules Eastleigh Padded Gilet is finished with the Joules hare logo and brass hardware. 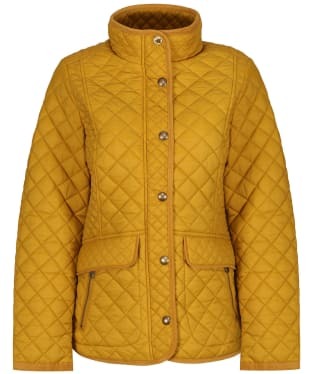 Perfect for when the weather starts to get cooler, the Women's Joules Newdale Quilted Jacket is sure to keep you warm and cosy. 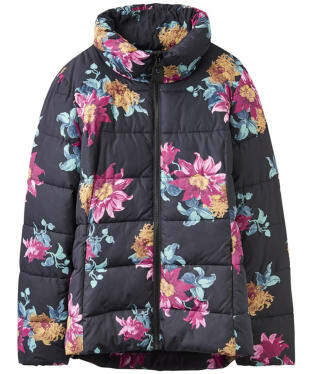 A firm favourite from the Joules collection, this beautiful coat has been designed with a stylish diamond quilted outer to offer a country inspired feel that we know you will love, with wadding inside the quilt to offer a snug feel whether you are walking the children to school or heading into town! With a zip and button down placket that fasten up to a stand collar, any chilly winds will be kept at bay. Sure to offer an on-trend look, this fitted jacket boasts cord trims and a stunning bespoke printed lining unique to Joules for that pretty feel. This timeless jacket is finished with two zip seam pockets that provide ample space to store your essentials whilst you are out and about. A classic style that we know you will love, the Women's Joules Woolsdale Duffle Coat is a timeless piece that is sure to keep you on-trend through this season and beyond. 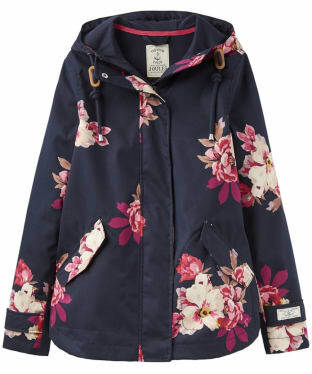 In true Joules style, this iconic coat has been given a little updating including a stunning bespoke printed lining even visible in the hood, for a feminine, pretty feel, as well as a zip and toggle front fastening that is sure to keep you cosy for that added touch of practicality. Crated from heavier weighted wool, this coat provides the upmost warmth, as well as a high quality, durable feel, and boasts a detachable hood, ideal for keeping those chilly winds at bay! For your added convenience, there are two large front pockets to the front that provide ample space to store your essential items whilst you are out and about. Whether you are walking the children to school or simply heading into town, this jacket is fabulous for everyday wear, and is perfect for placing over your favourite Joules sweater, shirt or top to complete your fashion forward look with ease. Add a touch of style to your wet weather attire with the Women's Joules Raine Waterproof Parka Jacket! Sure to keep you dry when the rain starts to fall, this fully waterproof jacket, features a grown adjustable hood, full zip and button placket fasten, as well as an adjustable lower hem, to keep water at bay! 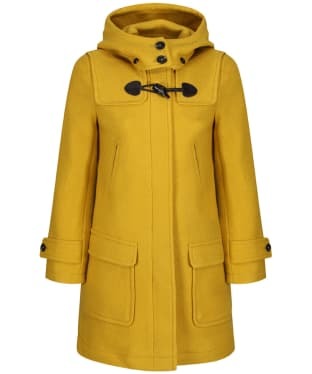 Whether you are heading out on a country adventure or simply walking the children to school, the Raine Parka Jacket is sure to keep you on-trend, with an elasticated waist to give you that figure flattering look, along with cuffs that can be turned back to reveal the beautiful bespoke Joules lining. For your added convenience, the parka has two front popper fasten pockets, providing ample space to store those basic essentials. The Raine Jacket is finished with signature Joules hare logo branding for that quality, fashion forward feel. 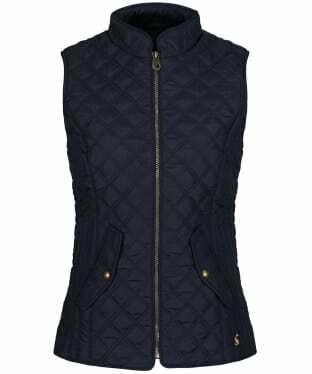 Bursting with country charm, the Women's Joules Braemar Quilted Gilet is sure to keep you warm and cosy without the added weight of wearing a winter coat. Designed with stunning diamond quilting, this timeless style will keep you looking on-trend through this season and beyond! Featuring elasticated side panels, the Braemar will be super comfortable to wear, offering you that perfect fit and fashion forward feel. For added convenience, the gilet has two front pockets, ideal for storing your mobile phone and other valuables when you are and about. The Braemar is finished with a beautiful bespoke printed Joules lining for that added feel of quality and style. With the unpredictable months looming, the Joules Highgrove Print Gilet will be the perfect layering piece to keep you snug. 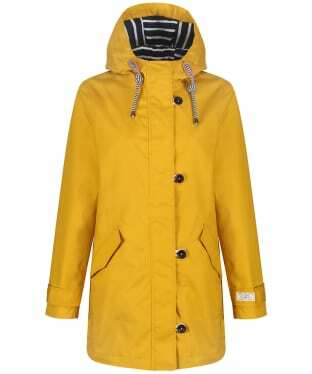 Crafted from 100% polyester, helping to maintain its shape and is quick to dry if you're caught in the rain. 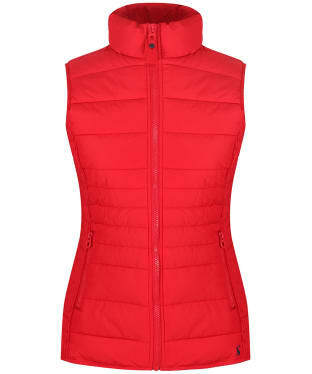 The gilet features a high neck and zip fastening for chilly days and side pockets to keep your personal belongings safe. The gathered side panels create a flattering nipped silhouette for all sizes. The Joules Highgrove Print Gilet is finished with a striking print to add some colour to grey days this season beings. 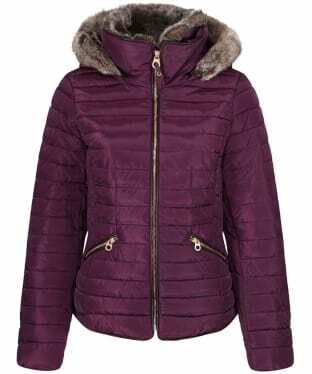 The Joules Florian Padded Jacket is a beautiful, baffle quilted jacket that is ideal for the winter months. 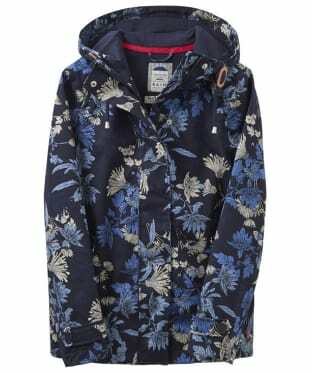 Complete with an all over bespoke Joules floral print, this stunning winter jacket is great for brightening up the darker days! 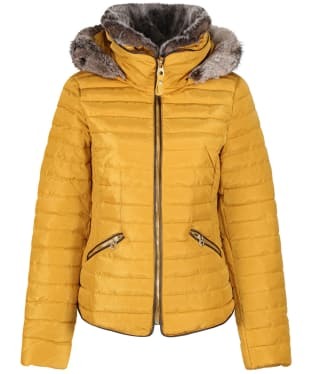 With a zip through closure to ensure complete protection from icy winds, this gorgeous jacket is right on trend, and even fastens right up to the chin to offer extra insulation. Give your wardrobe a pop of colour and interest this season with this beautiful and striking Joules Newdale Printed Jacket! 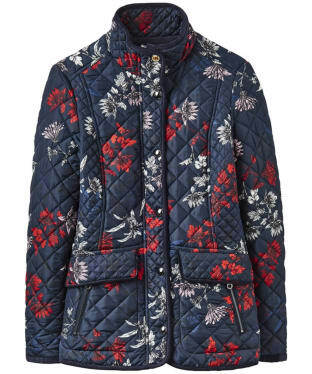 Complete with a bespoke Joules floral print, this stunning Joules jacket offers is finished with a quilted finish to add not only warmth, but that added dash of country style that you are sure to love. The edges of the Newdale Printed Jacket are tipped with a tonal edging to offer a premium finish, and are complimented by the muted silver hardware and Joules hare logo. With multiple pockets for your essentials, a funnel neck, and full zip and press stud closure, this Joules coat is sure to be a firm favourite for the winter months.